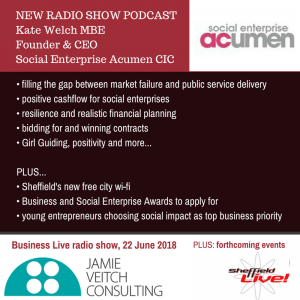 Kate Welch is founder and CEO of Social Enterprise Acumen, a community interest company (CIC) which supports social entrepreneurs to develop their concepts or grow their businesses. She joined me for an extensive radio interview on this morning’s show – and the podcast is below. It’s crammed with great advice for leaders of businesses and social enterprises. social investment: do impact investors understand social enterprises’ needs? public recognition and awards (Kate’s been awarded the MBE for services to social enterprise and the Queen’s Award for Enterprise Promotion) – do they help? 43:44 – (47:24) wrapping up. Check out the Social Enterprise Acumen website and find Kate on twitter. The Social Entrepreneur’s Guide to Winning Tenders.